For Airtel customers, HTC Magic also allows free data download of 100MB every month for a period of 6 months. The HTC Magic will be available at a market price of Rs. 29,900/- at Airtel Relationship Centres and authorised HTC resellers across 17 cities. The cities include Delhi, Mumbai, Bangalore, Chennai, Hyderabad, Kolkata, Pune, Ahmedabad, Chandigarh, Jaipur, Coimbatore, Cochin, Ludhiana, Jalandhar, Lucknow, Bhubaneswar, Patna. Hello Tunes Manager will be used by subscribers to search for, buy and share hello tunes/hello tune albums. You can use Hello Tunes Manager to send/receive hello tune recommendations from friends, rate hello tunes and much more. Special offer for HTC Magic – Free Hello Tune downloads for one month. This application provides detailed weather forecasts for the current day and next 6 days. Any location of user’s choice can be marked as favorite. The user can obtain weather forecast for (a) Current location (b) Favorite location (c) Any other location of choice. MobShare is a Mobile phone picture sharing Application that enables Immediate, controlled, and organized sharing of mobile pictures, and the browsing, of the shared Pictures. This application enables the user to search for contacts, image files, audio files and video files from a single interface. The user can search any of the above mentioned files starting with the query string entered. It provides the user to view the image or play the audio / video files without the use of any external applications. This application incorporates both location and data call technology, steering you towards the very best activities that your city has to offer. For the selected category, the application retrieves appropriate list of options for any location review. The application provides the full information (address, contact number and other information) for any selected option. User also has an option to call the selected option or SMS the info from the application. HTC Magic features a trackball with zoom in/out function. It is also equipped with fit-the-width rendering, and auto screen rotation for an easier navigation experience and internet browsing. 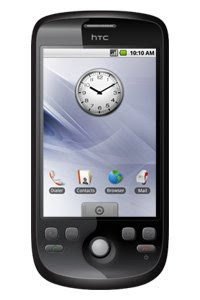 The HTC Magic has a 3.2” HVGA touch screen display and features a trackball for easy access and a 3.2 mega-pixel camera. It provides full fidelity PC browsing experience, where users can expand and personalise their phone to fit their lifestyle. HTC Magic is enhanced with cool HTC goodies like Smart Dialler and a versatile on-screen keyboard. Smart Dialler lets you call people in whatever way you like, by either dialling the phone number or by dialling the first few letters of the name of the contact. The versatile keyboard helps to choose the favourite way to type and the predictive text completion helps in typing much faster. Take your inbox with you wherever you go. HTC Magic allows Microsoft Exchange server synchronisation for email, calendar and contacts. Simply put, with HTC Magic, one can always keep the personal and office emails flowing.